Pretty much every Secret Warriors issue has me thinking that the next issue will contain some climax or story point which finally pays-off with Nick Fury winking with his one good eye and saying, "Just as I planned." Secret Warriors #21 does not leave me looking forward, but rather, the comic of the day has me living (or reading in this case) in the moment. Hickman has displayed this "the next issue will have the pay-off" in his S.H.I.E.L.D title, as well. I always end his books thinking I liked it, but that nothing really fully developed. I like the book while I read, but not when I'm done. Hickman books do that to me. 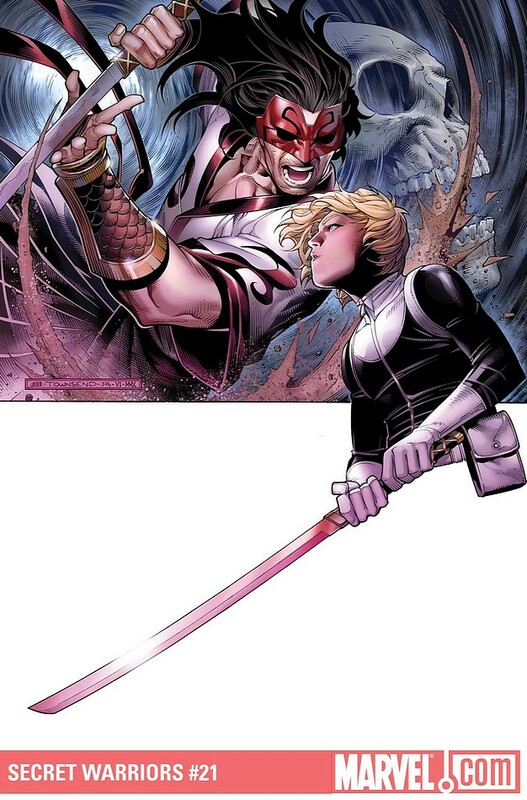 In Secret Warriors #21, Hickman finally comes back to swords which seemed to have great meaning many issues (months) ago. Hickman also comes back to the idea that a God has to complete some sort of task to be worthy of his God-hood. This idea was explored during "Dark Reign" with Ares and his son, Phobos. Finally, Hickman is getting back to that story's and the swords' stories significance...and I am into it. Thank you Jonathan Hickman, for rewarding my loyalty to your titles.